Welcome to this edition of the White House Initiative on Asian Americans and Pacific Islanders (WHIAAPI) Highlights. Below you’ll find information about the Native Hawaiian Educators Briefing, President Obama’s Meeting with U.S. Attorney General Loretta Lynch, and agency announcements. We invite you to visit our page at www.whitehouse.gov/aapi. and @KiranAhujaAAPI for Kiran Ahuja, the Executive Director of the Initiative. Follow us on Instagram @WhiteHouseAAPI. Please join us in celebrating AAPI Heritage Month with a groundbreaking discussion on closing the achievement gap for Native Hawaiian students on Friday, May 15, 2015 from 10-11:30 a.m. at the Lyndon B. Johnson Building Auditorium, U.S. Department of Education (400 Maryland Ave SW, Washington, D.C. 20202). By incorporating a P-20 model, educators are utilizing every stage in a child’s education to empower them, their families, and communities. These efforts seek not only to improve college access and success, but also instill pride and purpose in learning and preserving the Hawaiian language and culture. Don’t miss a dynamic discussion with key experts from Hawaii, who will share their knowledge, strategies, and best practices. Register here. The U.S. Department of Agriculture (USDA) is working hard to reach more AAPIs through community engagement and Asian language translated materials. For example, the USDA partnered with the California Department of Public Health to translate several flyers on important health and nutrition information into Hmong, Vietnamese, and Chinese. The USDA alsocollaborated with the Berkeley-Center for Weight and Health to translate a series of educational materials into Cambodian, Chinese, Hmong, Korean, Laotian, and Vietnamese. Materials like these provide AAPI communities with high quality, easy-to-follow tips in a convenient, printable format. To learn more about these and other USDA efforts, see the 2015 Federal Agency Accomplishments Report. Please contact the U.S. Department of Agriculture (USDA) directly with any questions. Following her swearing-in, President Obama met with Attorney General Loretta Lynch at the White House to welcome her to the team and reiterate that he looks forward to her leadership at the Department of Justice. The Attorney General thanked the President then updated him on several issues, including the events occurring in Baltimore, Maryland following the death of Freddie Gray, which the Department of Justice is currently investigating. Attorney General Lynch assured the President that she would continue to monitor events in Baltimore and that the Department of Justice stands ready to provide any assistance that might be helpful there. Learn more. Last Thursday marked the 10th year that the White House has participated in “Take Our Daughters and Sons to Work Day.” This year, in order to give more kids an opportunity to grow and broaden their horizons, the White House expanded its program beyond the children of Executive Office of the President staff to include children from the Boys and Girls Club of Greater Washington and the D.C. Child and Family Services Agency. 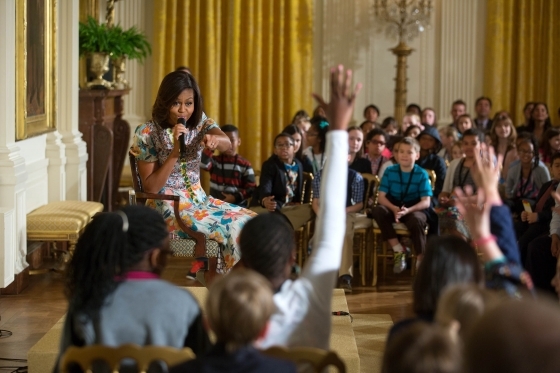 In keeping with this year’s theme, “Empowering Young Minds at the White House,” the programming was shaped around STEM education, the arts, and career exploration. Approximately 200 children began their day today by taking the Oath of Office, just as the President and all of his staff do. Learn more. President Obama celebrated the 45th-annual Earth Day by spending the afternoon exploring the Everglades in southern Florida. As a 1.5-million-acre wetland ecosystem, the Everglades is home to more than 350 species of birds, both alligators and crocodiles, and a wide diversity of plant life that gives shelter and beauty to the region. Unfortunately, the Everglades is currently threatened. Each day, climate change is negatively affecting the nature, species, and beauty of the region. But climate change isn't just hurting the Everglades -- it's hurting our parks, ecosystems, and outdoor spaces in every state and every region of America. Learn more. Acting Deputy Secretary of the U.S. Department of Health and Human Services (HHS), Mary Wakefield, Ph.D., R.N., announced the selection of three projects spearheaded by entrepreneurial teams across the agency. The chosen projects are part of the latest round of funding provided through the HHS Secretary’s Ventures program, a component of the department’s innovation initiative led by the HHS IDEA Lab. The announcement was made during the HHS IDEA Lab’s Shark Tank and Demo Day that showcased the results of innovation projects. “The three projects selected represent highly innovative solutions to challenging problems. They reflect cross-agency collaboration and creativity designed to improve our performance and the critical services we offer to the American people,” said Dr. Wakefield. Read more. Secretary of the Interior Sally Jewell and Director of the National Park Service Jonathan B. Jarvis today announced $3 million to assist eight cities in constructing and enhancing parks and other outdoor recreation facilities in disadvantaged neighborhoods. Projects range from the renovation of an athletic complex in Detroit, Michigan to construction of a new skate park in Madison, Wisconsin. The grants, part of a new competitive grant program called the Outdoor Recreation Legacy Partnership, are funded through the Land and Water Conservation Fund (LWCF). For more than 50 years, the Land and Water Conservation Fund has invested revenue from federal offshore oil and gas royalties into more than 40,000 outdoor recreation facilities and conservation projects in every state. Read more. Marking National Crime Victims’ Rights Week, Former Attorney General Eric Holder and Assistant Attorney General Leslie R. Caldwell of the Justice Department’s Criminal Division announced that the Justice Department’s Asset Forfeiture Program has returned more than $4 billion in civilly and criminally forfeited funds to crime victims since fiscal year 2002, with $723 million paid to over 150,000 crime victims in the last three years alone. The funds were distributed through the victim compensation program managed by the Criminal Division’s Asset Forfeiture and Money Laundering Section. “The Justice Department’s victim compensation program is an integral part of the asset forfeiture program and our efforts to take the profits out of crime, to restore assets to their rightful owners, and to provide real and meaningful justice to the victims of wrongdoing,” said Former Attorney General Holder. Read more. The HHS, Administration for Children and Families, Office of Family Assistance is announcing that it anticipates competitively awarding cooperative agreements to support demonstration projects that are designed to provide eligible individuals with the opportunity to obtain education and training for occupations in the health care field that pay well and are expected to either experience labor shortages or be in high demand. In addition to providing education and training services, funds for this project may be used for child care, case management, and other supportive services as appropriate. Read more. The Office of Minority Health (OMH) at HHS announces the availability of funds for Fiscal Year 2015 for the Partnerships to Increase Coverage in Communities II (PICC II) Initiative. The purpose of the PICC II Initiative is to educate racial and ethnic minority populations, including those that are economically and/or environmentally disadvantaged, and immigrant and refugee populations who are eligible for health coverage through the Health Insurance Marketplace (Marketplace). The PICC II also assists this population with the application for eligibility, enrollment in the program, and help with obtaining or purchasing health coverage offered through the Marketplace. Learn more. The National Science Foundation’s program, Increasing the Participation and Advancement of Women in Academic Science and Engineering Careers (ADVANCE), has three goals. (1) To develop systemic approaches to increase the representation and advancement of women in academic STEM careers. (2) To develop innovative and sustainable ways to promote gender equity in the STEM academic workforce. (3) To contribute to the development of a more diverse science and engineering workforce. ADVANCE also has as its goal to contribute to and inform the general knowledge base on gender equity in the academic STEM disciplines. Learn more. The Centers for Medicare & Medicaid Services (CMS) announced the availability of funding to support Navigators in Federally-facilitated Marketplaces (FFM), including State Partnership Marketplaces. The Affordable Care Act is working for millions of Americans who are able to access quality health coverage at a price they can afford, in part because of the efforts of in-person assisters in local communities across the nation. People shopping for and enrolling in coverage through the Health Insurance Marketplaces can get local help in a number of ways, including through Navigators. Navigators provide objective information about health coverage to consumers to help them make the best possible choice. They are knowledgeable about qualified health plans in the Marketplaces, and public programs including Medicaid and the Children’s Health Insurance Program. Grantees will be selected for a three year project period, and a total of up to $67 million is available for the first year of the award. For more information about Navigators, read more. Join the Pre-Application Conference Call on May 6, 2015 at 4:00PM ET by registering here. The ANNH Program is authorized under section 317 of the Higher Education Act of 1965, as amended (HEA), to provide grants to eligible institutions of higher education (IHEs) to enable them to improve and expand their capacity to serve Alaska Natives and Native Hawaiians. Institutions may use these grants to plan, develop, or implement activities that strengthen the institution. Background: We encourage applicants to read carefully the Selection Criteria section of this notice. Consistent with the Department's increasing emphasis in recent years on promoting evidence-based practices through our grant competitions, the Secretary will evaluate applications on the extent to which the proposed project is supported by a logic model that meets the evidence standard of “strong theory” (as defined in this notice). Learn more about the Native Hawaiian-Serving Institutions Program. Learn more about the Alaska Native Serving Program. Join the Technical Assistance Webinar on May 1, 2015 at 3:00PM ET by registering here.